Back in the old days, any pepper that was pretty hot was called a Cayenne pepper after the region in South America that was known for its export of these hot peppers. Every spice rack should have this! 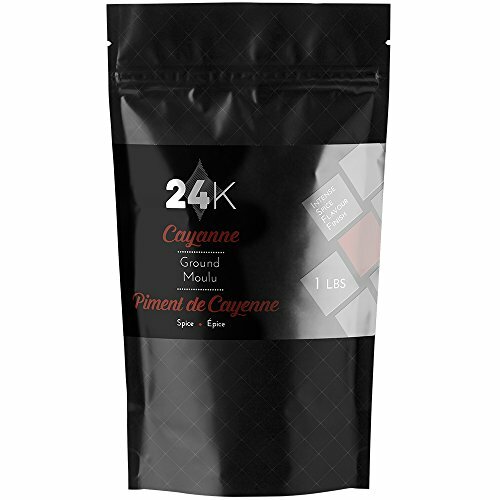 Cayenne is a large, red, hot pepper that is dried and ground to a bright red powder and added to cooking for its spice and intense heat. It is used to finish a traditional Hollandaise sauce and in hot crab dishes. It is a staple ingredient in dry spice rubs for meats such as spareribs and adds heat to barbecue sauce. If you have any questions about this product by 24KSalt, contact us by completing and submitting the form below. If you are looking for a specif part number, please include it with your message. Carrington Farms Organic Milled Flax Seed, 14 Ounce - 6 per case.